We’ve seen in the previous examples that solving a problema while using the lagrangian formalism would lead us to the same equations of Newton’s formalism. In this section we’ll show that both formulations are indeed equivalent for conservative systems. Since our analysis doesn’t depend on the type of coordinates one uses we’ll choose to use rectangular coordinates. Hence it is and . It is and . Hence . Since for a conservative system it is it follows that Finally it is which is Newton’s Second Axiom. Since the dynamics of a particle are a result of this axiom the dynamics of a given particle have to be the same on both formulations of mechanics. As you certainly noticed in the previous examples the absence of generalized coordinate on the lagrangian of the system implied the conservation of a momentum (angular or linear). These coordinates that don’t appear on the lagrangian are called cyclic coordinates in the literature. Obviously that the presence or absence of cyclical coordinates on a lagrangian depend on the choice of coordinate that one makes. But the fact that a moment is conserved cannot depend on the choice of the set of coordinates one makes. Since the right choice of coordinates is linked to the symmetry that the system exhibits one can conclude that symmetry and conserved quantities are intrinsically connected. As we saw in Newtonian Mechanics 01 a frame is said to be inertial if time is homogeneous. When one says that time is homogeneous one is saying that one can perform a continuous time translation (formally one says ) and the characteristics of the mechanical system won’t change. where (the sign will be apparent later) is some constant. Then we can write equation 14 as . From this it follows . The function is called the Hamiltonian and its definition is given by equation 14. The potential energy is velocity independent so that the terms can be eliminated. As we saw in Newtonian Mechanics 01 a frame is said to be inertial if space is homogeneous. When one says that space is homogeneous one is saying that the lagrangian is invariant under space translations. Formally one says that for . For the previous expression to be identically one has to have since the are arbitrary variations. According to Euler-Lagrange equations 13 one also has . Hence the homogeneity of space to translations implies the conservation of linear momentum in an isolated system. 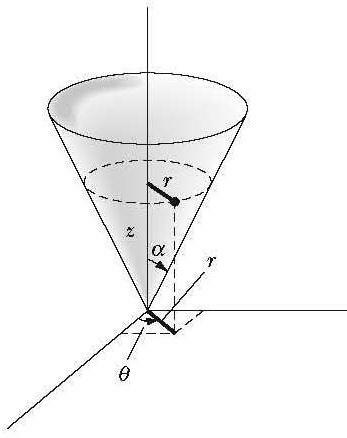 As we saw in Newtonian Mechanics 01 a frame is said to be inertial if space is isotropic. When one says that space is isotropic one is saying that the lagrangian is invariant under space rotations. Formally one says that for where . Since and , it follows . Since is an arbitrary vector it follows . Hence is constant. In conclusion one can say that space isotropy implies the conservation of angular momentum. Another important result is that whenever a mechanical system has a symmetry axis the angular momentum about that axis is a conserved quantity. As a consequence of the previous definition it is . Which are called the canonical equations of motion. When one uses these equations to study the time evolution of a physical system one is using Hamiltonian Dynamics. One has . Furthermore one also have which implies that if the Hamiltonian function doesn’t depend explicitly on then is a conserved quantity. Example 7 A particle of mass moves on the surface of a cylinder subject to a force which points to the center of the cylinder (the origin of our frame) and is proportional to the distance between the particle and the origin. Since this a conservative system and and transformation equations between coordinates systems don’t depend on time, is the total energy of the system and it is a function of , , and . But doesn’t appear in the Lagrangian (thus it is a cyclic coordinate). From the previous relationships one sees that the angular momentum about the axis is constant . Which is equivalent to saying that the axis is a axis of symmetry of the system. We also have with . Which means that the particle describes an harmonic motion along the axis. To finalize our treatment of classical dynamics let us just make a quick summary of Lagrangian and Hamiltonian dynamics. The generalized coordinates and the respective generalized momenta are said to be canonical coordinates. Coordinates that don’t appear explicitly on the expressions ok and are called cyclical coordinates. A coordinate that is cyclical in also is cyclical in . A generalized coordinate and and it’s corresponding generalized momentum are said to be canonical coordinates. Example 1 Let . Take as a parametric representation of . Let , and . Given the previous parametric equation find such that is a minimum. Example 2 As an example let us try to derive the equations of motion of a particle that moves in a constant force field starting its movement from the state of rest. The particles starts from point and goes to point . From the enunciate it follows . Let us take our original point as being our reference point for the potential. Then it is . Heron explained the law of light reflection using a principle of minimum time. Fermat corrected Heron’s Principle by stating that light travels between two points in the shortest time available. Maupertuis stated his minimum action principle that postulated that a particle’s dynamics always minimized the action. Gauss postulated his principle of least constraint. Hertz postulaed his principle of minimum curvature. In modern Physics one uses a more general extremum principle and the focus of this section will be to state this principle and flesh out its consequences. Definition 2 The lagrangian (sometimes called the lagrangian function), , of a particle is the difference between its kinetic and potential energies. For rectangular coordinates it is , , so (where is called Newton’s notation). Hence it is which is just the harmonic oscillator dynamic equation that we already know. Example 4 Consider a planar pendulumplanar pendulum write its Lagrangian and derive its equation of motion. This is precisely the equation of motion of a planar pendulum and this result is apparently unexpected since we only analyzed the Lagrangian for rectangular coordinates. Consider a mechanical system constituted by particles. In this case one would need quantities to describe the position of all particles (since we have 3 degrees of freedom). In the case of having any kind of restraints on the motion of the particles the number of quantities needed to describe the motion of particle is less than . Suppose that one has restrictions than the degrees of freedom are . Let . These coordinates don’t need to be rectangular, polar, cylindrical nor spherical. These coordinates can be of any kind provided that they completely specify the mechanical state of the system. Definition 4 The set of coordinates that totally specify the mechanical state of particles is defined to be the set of generalized coordinates. Since we defined the generalized coordinates of a system of particles one can also define its set of generalized velocities. Definition 5 The set of velocities of a system of particles described by a set of generalized coordiinattes is defined to be the set of generalized velocities. Let denote the particle, , represent the degrees of freedom , and the number generalized coordinates . Example 5 Consider a point particle that moves along the surface of a semi-sphere of radius whose center is the origin of the coordinate system. The relevant equations are and . Let , and be our generalized coordinates. The time evolution of a mechanical system can be represented as a curve in the configuration space. Since and are scalar functions is also a scalar function. Therefore is an invariant for coordinate transformations. are the analogies to be made now. The equations of constraint have to be functions between the coordinates of the particles and can also be a function of time. Example 6 Consider the motion of a particle of mass along the surface of a half-angle cone under the action of the force of gravity. Since it is . Hence it is . The angular momentum about the axis is . Thus expresses the conservation of angular momentum about the axis of symmetry of system. It is left as an exercise for the reader to find the Euler-Lagrange equation for .